Conquer the capital of Canadian cool with a weekend of outdoor dining and cultural pursuits. 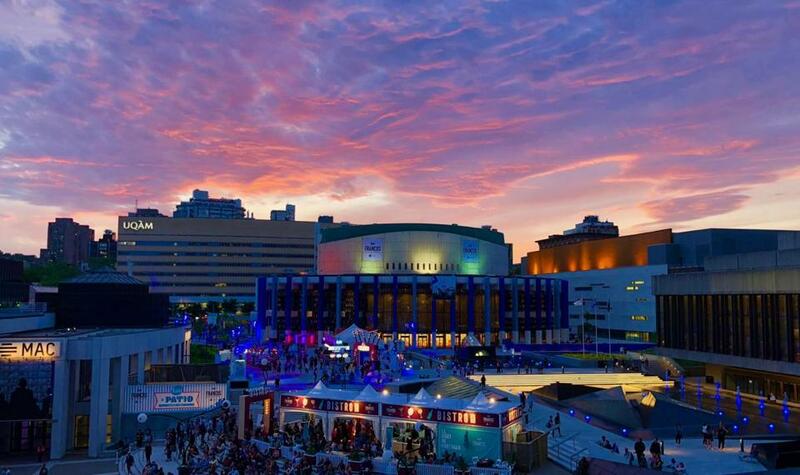 Twilight at Place des Arts in Montreal. Your Perfect Weekend is a new monthly column in which Globe travel writer Christopher Muther picks a city or town and creates a weekend itinerary of favorite haunts. MONTREAL -- During warm summer evenings, the residents of Montreal appear to have one goal: Get outside. There are more outdoor festivals than you can shake a smoked meat sandwich at taking place every night. Restaurant patios and terraces return from winter dormancy, sprouting from the sidewalks and spilling into the streets like welcomed weeds. But before you visit any of those spots, please make your way to a nondescript pub down a scrubby alley. Pourquoi, you ask? Because, my friends, the pub in question has one of the most stunning outdoor dining spaces in the city. It puts conventional sidewalk cafes to shame. 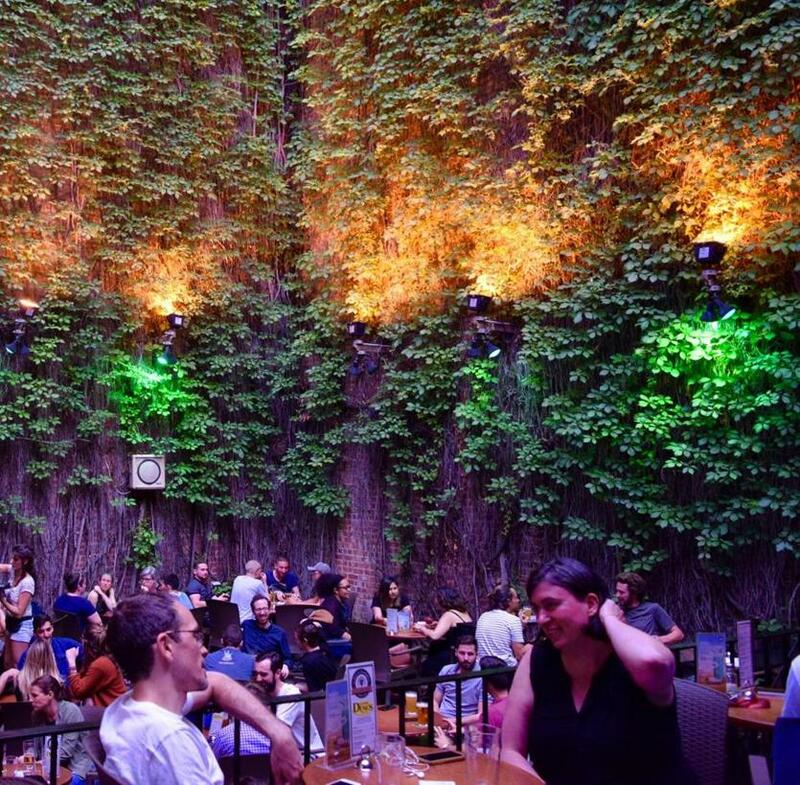 Le Sainte-Elisabeth, a bar that is conveniently located on a street of the same name, has a dramatic outdoor patio where ivy grows several stories high on adjacent buildings and trees provide shade. It’s like a well-maintained jungle. Words can’t really do it justice, so I’ll pointedly tell you to go and see it for yourself. Order a beer, nothing too fussy, and relax. Arrive on the early side or make a reservation to ensure you get a seat outside. What else should you do? Thanks for asking, because I’m now going to tell you how to spend a perfect summer weekend in Montreal. BikE: Montreal was named the most bike-friendly city in North America by the Copenhagen Bicycle Friendly Cities Index. Some people bike here year round, bless their chilly hearts. I prefer a more practical approach and use the Bixi bike share program during the summer. If you’ve never biked in Montreal, or you’re not one of those fancy Spandex-wearing speed racers, I recommend the Lachine Canal-Old Port trail. It’s easy, it’s completely off-road (on a paved path) so you won’t be battling cars, and it’s nearly impossible to get lost. If you want to take it slow there are plenty of shady areas to rest. You can check a map or go online to find a trail, or pop into a bike rental shop in Old Port and they’ll be happy to help. Culture: The McCord Museum may not be as well known as the Montreal Museum of Fine Arts or the Musée d’art contemporain de Montréal, but it’s worth a visit, particularly this summer. There are two fascinating exhibitions currently running. The first, “Balenciaga, Master of Couture” (through Oct. 14), is a retrospective of the work of Spanish designer Cristóbal Balenciaga. His meticulous mid-century structured dresses, gowns, and jackets are breathtakingly chic. The McCord is also showing “Shalom Montreal” (through Nov. 11), an exhibition of how the Jewish community of Montreal contributed to the city’s growth and personality. You’ll likely want to swing by St-Viateur Bagel after the museum. McCord Museum. 690 Sherbrooke St W., 1-514-861-6701, www.musee-mccord.qc.ca. Boxotel : I discovered the recently-opened Boxotel when I needed a last-minute (and inexpensive) place to stay. I couldn’t believe my good luck. My room had a full kitchen, complete with a dishwasher and washer-dryer. 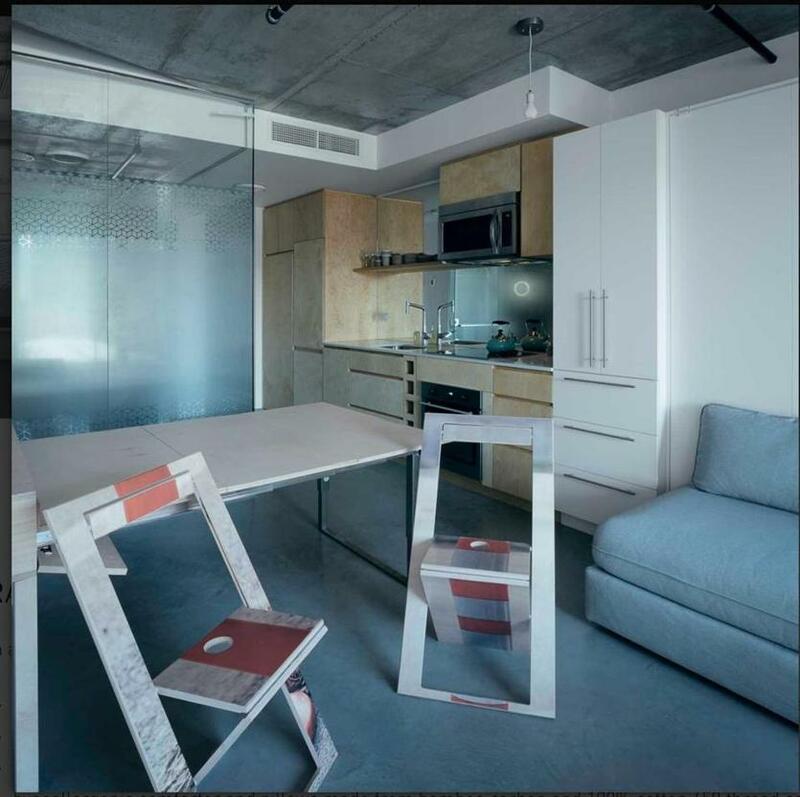 It resembled a minimalist micro-loft with Scandinavian blond wood cabinets and poured concrete floors. It was designed by Quebec reality television star Marie-Jeanne Rivard. The desk pulled out into a dining table, pieces of art on the wall were actually folding chairs, and the Murphy bed disappeared into the wall to provide more space. I was smitten. I snagged a rate of $130 a night. Those prices will likely climb through the summer, but watch for deals. There’s a small hipster cafe in the lobby, and communal workspace on the lower level. It’s close to the action in the Quartier des Spectacles. 175 Ontario St E., 1-514-281-0202, www.boxotel.com. Dinette Triple Crown : I love the novelty of Dinette Triple Crown’s picnic baskets. It’s a great way to enjoy a picnic and let someone else do all the work. Order some fried chicken, a pulled pork sandwich, or mac and cheese. The folks at Triple Crown pack everything you need. Walk to the park across the street in Little Italy, and return the basket when you’re finished. 6704 Clark St., 1-514-272-2617, www.dinettetriplecrown.com. Labo Culinaire Foodlab : At the top of the Société des Arts Technologiques is the Foodlab’s beautiful terrace overlooking Montreal’s entertainment district. The menu is as experimental and ever changing as the events in the arts space below. There’s an emphasis on seasonal, local food and a well-curated natural wine list. It’s cool, but not frighteningly so. 1201 St Laurent Blvd., 1-514-844-2033, sat.qc.ca/fr/laboculinaire. Terrasse Nelligan : Terrasse Nelligan at the Hôtel Nelligan is a Montreal staple of outdoor dining and not one of the city’s many, many buzzy restaurants. A list of those restaurants is a story in itself, But the food here is solid and the views of Notre Dame Basilica and the St. Lawrence River are incredible. Plan your visit around sunset and sip on l’assassin, a strong cognac-based cocktail with lemon juice, mint, and strawberries. 106 Saint-Paul St W., 1-514-788-4021, terrassenelligan.com/home. Montreal International Fireworks Competition: There are festivals for nearly everything in Montreal, although I’m still waiting for a cat festival. But the one that seems the most wonderfully over-the-top and summery is the International Fireworks Competition. The nations of the world duke it out for pyrotechnic superiority every Saturday and Wednesday night through July and into early August at the Parc Jean-Drapeau. It kicks off July 7 at 10 p.m. with a pyrotechnic tribute to Abba and concludes on Aug. 8 with a celebration of James Bond. 1 Circuit Gilles Villeneuve, 1-514-872-6120, www.parcjeandrapeau.com/en. The Canal Lounge : End a perfect Montreal day on a perfectly adorable barge that’s been converted into a cocktail lounge. Please note that the Canal Lounge is not a party boat, but instead a very swank little bar that stays docked near Atwater Market on the Lachine Canal. Raise a glass (I recommend the Captain’s Punch) and congratulate yourself on a weekend well spent. 22 Atwater Ave., 1-514-451-2665, www.facebook.com/canallounge.